AIVIA® 50 Indoor Cabinet by HD1PY, Inc. Designed for indoor AED storage, The AIVIA 50 is a wall mount cabinet capable of storing any size, any model AED. This cabinet features a clear anti-UV polycarbonate cover with a red ABS plastic chassis. These materials make AIVIA cabinets extremely lightweight and durable. 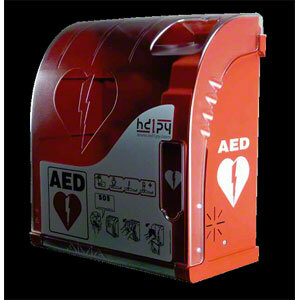 The clear cover allows for easy inspection of the AED inside without opening the door. Mounting your AIVIA cabinet could not be easier. The included template allows you to drill holes in the wall to match up with the pre-drill holes in the cabinet chassis. The AIVIA 50 is a rugged yet economical solution for storing your AED. Weight - 7.72 lbs. Dimensions - Length: 15 1/4"; Height: 16 5/8"; Depth: 7 15/16". 1-year manufacturer's warranty.